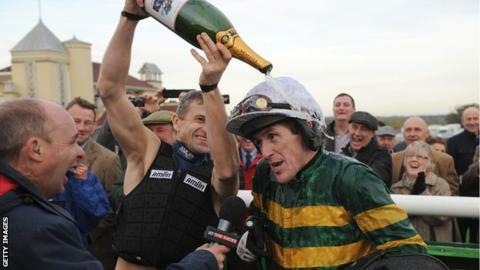 AP McCoy says he would love to win a 20th title next season and has not ruled out going for 5,000 career wins. The 39-year-old is on course to win his 19th consecutive jockeys' championship in April and passed the unprecedented landmark of 4,000 victories last month. "Twenty would be nice. We'll have to see how it goes and get to 19 first," the Northern Irishman told BBC Sport. "I'm getting closer. You never know, do you? You just keep on going and see what happens." The British Jump Jockeys Championship is decided on ridden winners in National Hunt races from 28 April 2013 to 26 April 2014. McCoy has suffered a series of injuries during a career spanning more than 20 years, and spent six days in intensive care after a fall at Cheltenham in April. His father Peadar has said that he hopes his son, who finished third in the BBC's Sports Personality of the Year awards behind Andy Murray and Wales and British & Irish Lions rugby union player Leigh Halfpenny, will retire at the end of the season. But the rider, who moved to 4,031 wins after a double at Ffos Las on Monday, said: "Being champion jockey is my little thing that proves to me whether I've still got it or not. "If I'm champion jockey I feel I'm confident enough that I can keep going." His wife Chanelle told the BBC last month that she would "cut up his licence" if he tried to reach the 5,000 milestone. "It's a bit of a touchy subject, but she'll be all right. She'll come round," said McCoy. Few jump jockeys stay at the top of the sport past the age of 40, but when asked whether he was concerned about injuries as he gets older, he replied: "Now, my pain threshold is better than ever. "You get used to it. The more it's happened to me, the more I've been able to cope. "I've said it a few times and I'm probably not that bright for saying it, but I actually think I'm never going to get injured. "I know that doesn't sound very intelligent because I get injured quite a lot, but I think I'm always going to be OK."